Being a survivalist or “prepper” doesn’t have to mean retreating to a bunker somewhere to whittle away your days counting ammo. To me, it simply means recognizing that everything can change for the worst in a very short time, and being prepared for that mentally, physically, and materially is our responsibility as citizens, husbands, and parents. Knives are among the most simple and versatile tools at our disposal in an emergency situation, as they have the ability to feed us, shelter us, and defend us. Today, we’re going to look at a famous survival knife from a famous brand: the Ka-Bar Becker BK2. Known for producing the official knife of the United States Marine Corp. since 1942, Ka-Bar designed the Becker BK2 to be the “go to” camping and survival knife, using input from renowned survivalist Ethan Becker (hence the name). There’s a lot to discuss when it comes to this formidable blade, so see below for my full Ka-Bar Becker BK2 Review. 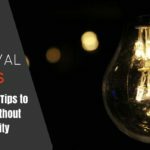 It will get the job – almost any job – done, but it will not impress you with any of its capabilities while doing so. Drop point blade is thick and wide, with a substantial flat grind. Knife doesn’t really “excel” at any task or job. A great chopper, cutter, and slasher, but the point is also strong enough for piercing. No jimping or texture on the handle – needs a better grip. Designed by two trusted names: Ethan Becker and Ka-Bar. Quite forward heavy as well as just heavy in general. Oversize lanyard hole, exposed pommel, and durable, versatile sheath. Thumb release on the sheath slows deployment. Powder coating will resist rolling as well as wear and corrosion. For many people in the market for a new knife, price, reviews, and ratings are the defining factor in which blade they eventually go with. Few take the time to properly “read between the lines” and discover the true drawbacks or benefits of a given blade before purchasing. For survivalists and preppers, however, investing in a blade like the Ka-Bar Becker BK2 is no simple decision. After all, this is the knife that you’re going to need to perform in life-or-death situations, and you need to know how well it will measure up. Blade Size – There are a million uses for a knife, and each one could have a blade specifically designed for just that. It’s crucial to evaluate a knife’s blade size for its potential for both versatility and specialization. Heft – Survival knives may be called upon to do more than just cut meat, which is why many companies design these models with more weight. Steel – Knowing exactly what type of steel you’re dealing with – and what it can handle – can mean the difference between a long-lasting tool and a waste of cash. Design – Knowing what your knife was designed for is the first step in figuring out what you can do with it. Some blades are meant to pierce, others slash, still, others hack, chop, or baton – it’s rare to find one that can do all equally. In the most general of terms, the Ka-Bar Becker BK2 is a “companion blade.” This means that it is equally at home chopping carrots, skinning game, or cutting kindling. It’s weight, design, steel, and blade size all lean towards versatility more than anything else. The knife also comes with a pedigree, as it was produced by Ka-Bar and designed by survivalist Ethan Becker – two names that carry quite a bit of weight in the knife-making world. That being said, the knife is not prohibitively costly and is readily available for purchase with fast, reliable shipping. The BK2’s full-tang blade made of 1095 high-carbon steel has a super high flat grind, allowing the .25” thick blade to mimic a thinner knife if whittling or detailing is needed. That being said, the drop point also has a quite sturdy tip, which allows the BK2 to be quite effective at splitting and batoning wood. As I mentioned, the Ka-Bar Becker BK2’s blade is a reasonable 5.25”, giving the knife a respectable but not ridiculous size of 10.62”. It is unique in that it is very thick in the spine (.25” to be exact), but features a high-enough grind to allow the “heavy” knife to do some delicate work. The point is also quite strong, making it up to the task of batoning and splitting wood. A concern with the high flat grind, however, is that rolling could become a real problem. The manufacturer has addressed this with a thick powder-coating, however, and reports of rolls that can’t be sharpened out have been few. For a “jack of all trades” knife, a drop point makes perfect sense, so there’s really not much to complain about there. The lack of jimping seems odd at first, but the manufacturer claims this is to keep thumbs from getting worn and callused from a hard day’s work. Still, given the lack of slip-resistance of the kydex handle, some jimping wouldn’t have been a terrible idea. The blade looks great, of course, thanks mainly to the high grind and powder coating, but the real standout aspect of the design is the large choil that, when used correctly, can strike a fire in the field. The major drawback of the blade design here is the steel. While 1095 is ultra-durable, it will require a bit of care to keep it from rusting – which takes a few strikes of the BK2’s “survival” cred. 1095 is an excellent all-around steel for a survival knife. 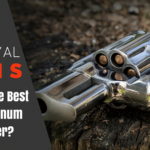 It’s heavy, reliable, and holds an edge for a long time. Another great aspect of this steel is that, if you do manage to chip it, you can most likely salvage the knife by sacrificing a little bit of the grind. What doesn’t make sense about the 1095, however, is its tendency to rust. Survival knives, after all, aren’t just designed for slicing dry kindling. Though the anti-corrosive powder coat will help prevent rust initially, if you lose that, you’ll start seeing rust pretty quickly. The Ka-Bar Becker BK2’s handle is made up of two 5.35” sections of high-density plastic (known by its manufacturer name: Zytel). These two halves are secured over the BK2’s full-tang steel by three large Allen wrench screws. As mentioned, a rather generous portion of the full-tang protrudes out the back. The handle shape, designed by Ethan Becker and featured on all his signature knives, is extremely simplistic, with more attention paid to general ergonomics than individual finger grooves. As the blade is .25” thick, the addition of the Zytel makes for a thick handle anyway, but the palm swell makes this much more noticeable. As the knife weighs a solid pound, a thick handle only makes sense. However, the lack of gripping material is a bit of letdown. In fact, even many positive reviews recommend covering or taping the handle to improve grip. It’s not a deal-breaker, but it is a huge albatross around the neck of a mostly positive design. While the Becker BK2’s sheath does have its detractors, it is far from an afterthought. Made of plastic and heavy-duty nylon, the sheath is simple and lightweight, but quite sturdy. The sheath’s best feature (or worst, depending on who you ask) is the thumb release that snaps the blade into place upon insertion. Before you ask – yes, this release does need to be pushed to draw the knife out of the sheath. This, according to many people, is just too much effort for something that might need to be used in an emergency. On the other hand, the sheath having lots of locks and webbing to secure the knife to packs, belts, and other gear means it may end up upside down at some point, so this feature is not all bad when you compare it to losing your knife entirely. Taking all of the knife’s components into consideration, there doesn’t seem like too much the Becker BK2 can’t handle. However, it also seems rather clear that the manufacturer was going out of their way to produce a “jack of all trades, master of none” knife. While this is understandable, and even somewhat desirable in a survival blade that will have to perform many different functions, you’d think there would be one aspect of the BK2 that blows away the competition. Nearly indestructible – most users show little to no regard for batoning or splitting piles of wood the Becker BK2. It stands up to a lot of punishment with little wear and tear. While a lot has been said about its ability as a chopper, it should be noted that this blade is quite useful for precision tasks, providing you keep a nice sharp edge on it. There are alternatives to the Ka-Bar Becker BK2 if you want to check out other options. Here is a look at some of the best ones. The Schrade SCHF36 Frontier is billed as a budget-friendly “bushcraft” blade that’s tough, reliable, and ready for whatever “the great outdoors” has to throw at it. At 10.4” overall, and with a 5” 1095 high-carbon blade, this is a comparable, though slightly less expensive alternative to the Becker BK2. The SCHF6 stands out mainly due to its TPE handle, which will offer a much more reliable grip in both wet and dry conditions than the Ka-Bar’s more simplistic handle. It also has a more substantial finger choil and some unique jimping on the underside of the handle – again, to increase grip. Like the Ka-Bar, the Frontier boasts a durable powder coat, drop point design, Ferro rod, and full tang construction., but its the price point and handle that will make all the difference here. TPE handle boasts extra jimping and a great texture to maximize grip. Drop point design with a 5”, power coated blade. Polyester belt sheath makes EDC a real possibility. Large finger choil for added protection. Full tang construction with Ferro rod and sharpening stone. 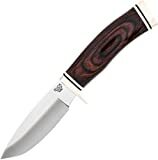 The Buck 192 Vanguard is billed mainly as a hunting knife, and performs much like you would expect a hunting knife to perform. Still, that doesn’t necessarily mean this blade should be pigeon-holed. It’s size, build, and steel makes it a great alternative to the BK2. At 8.5” overall, the Vanguard is much smaller than the Ka-Bar but boasts a blade that is still pretty formidable (4.25”). The 420 high-carbon steel is an excellent choice for a survival knife as well, as it offers superior strength, edge retention, and natural corrosion resistance. Perhaps the most significant differences to note are the weight, which is nearly 1/3 that of the BK2, and the much thinner blade. These aspects will make the Vanguard much better suited to precision tasks but will keep it from being as reliable for bushcraft. Thinner blade makes it much more suited to delicate tasks. Includes a nice, durable leather sheath. Deep choil and walnut composite handle give it a striking look and excellent grip. Make in the USA with a lifetime warranty. 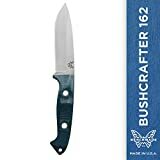 For every item, there’s a “Cadillac” version, and when it comes to versatile drop point field knives, the Benchmade Bushcrafter 162 is it. Though the price tag is quite steep, this rugged knife is backed up by two-lifetime warranties, including “LifeSharp,” which allows you to send the blade back for sharpening, oiling, and readjusting anytime during ownership. Overall, the Bushcrafter is a smaller, more precision design than the Ka-Bar. While boasting a similar drop point design and full tang construction, the Bushcrafter uses American made CPM-S3OV steel for maximum edge retention and corrosion resistance. The 4.40” blade is sandwiched between an easy-to-grip G-10 handle, which gives the knife a more EDC-friendly length of 9.15”. If you’re looking for a performer, this one will give you a five-star show. If budget is a factor, however, you might be in for some sticker shock. Rugged, versatile drop point knife with full tang construction. CPM-S30V steel holds a great edge and resists corrosion. Lifetime warranty on both the knife and the blade, with sharpening included. Comes with a high-quality kydar sheath. All things considered, the Ka-Bar Becker BK2 may not be the world’s greatest survival/bushcraft knife. However, for its price, it boasts a wide array of features and performs quite well at almost every task it is put to. In many cases, this is all we can ask from a blade when facing uncertainty. In the end, it is either there for you when you need it, or it isn’t, and the Becker BK2 seems to be the kind of knife that will be there – flaws and all. 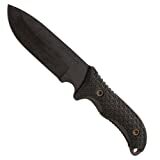 For more details on the Ka-Bar Becker BK2, click on the link below.